Surprising PROFINET Market Share Numbers! Just last week I attended the PROFIBUS Trade Organization’s (PTO) annual meeting. It was two days of great presentations and networking with other members. The first major announcement was that the PTO is changing its name to PROFIBUS & PROFINET International North America (PI). They also announced a new website for PROFINET information and application examples. You can visit the new site today at allthingsprofinet.com. 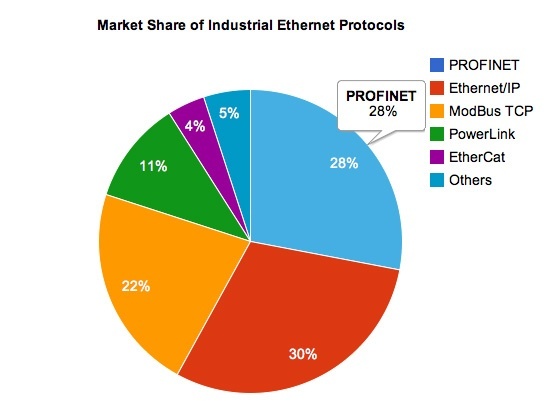 As you can see in the pie chart above PROFINET is making some impressive gains in market share amongst the other Industrial Ethernet based protocols. Another big announcement made at the annual meeting was that GE’s Intelligent Platforms Division and several other semiconductor companies have committed to using PROFINET going forward. While many companies who are in full production are using PROFIBUS today, those who are working on new designs are looking closely at PROFINET for future Ethernet implementations. PROFINET seems to have addressed the levels of performance needed and the real-time issues found in basic Ethernet, Real-time Ethernet, and Isochronous Real Time Ethernet. The first two types of PROFINET (Basic and Real-Time Ethernet) can be implemented using standard Ethernet controllers. The isochronous version of PROFINET requires special Ethernet MAC controllers that can guarantee packet delivery. We believe that most applications out there can be accomplished using standard Ethernet controllers.